The Great KiwiCombo Pass. See New Zealand your way! – Page 2 – Brought to you by Linda Jenkins, South Pacific Travellers World. A generous area of the central North Island, 78, 618 hectares to be precise, is the Tongariro National Park. The nearest towns are Turangi, National Park and Ohakune, plus the small alpine village of Whakapapa which is located within the Park itself. A mecca for skiers in the winter, during summer Whakapapa transforms into a hikers’ heaven, with a multitude of excellent hiking trails on offer. 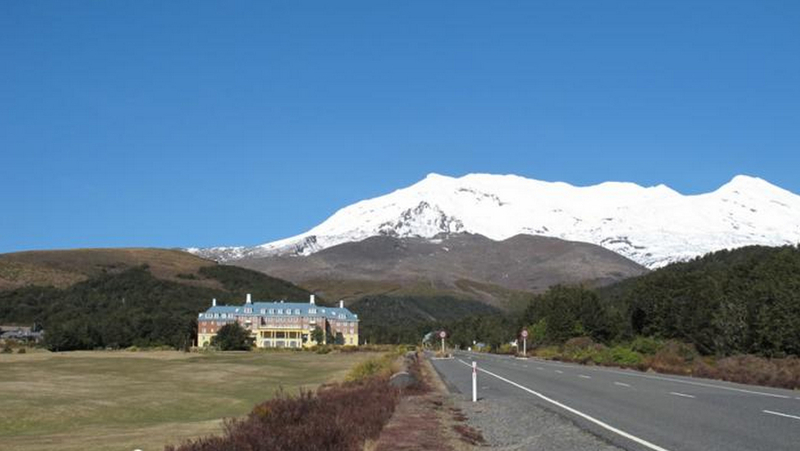 The most renowned of the walking tracks is the Tongariro Alpine Crossing, 19.4km one way and a good 6-8 hours hike. It can be walked unguided but to get maximum enjoyment from the trip, joining a small group with a guide is an excellent option. Local transfers are taken care of and you can be confident that all safety precautions are being adhered to. The region’s weather is highly unpredictable and it can rain or snow any time of the year. The guides have state-of-the-art communications to ensure any adverse weather changes are known sooner rather than later. If a full day hike is a bit beyond your timeframe, the Tongariro National Park offers a multitude of other great options, one of which is Taranaki Falls Walking Track. This is a 6km loop track, starting and finishing from Whakapapa village, that takes approximately 2 hours. The upper and lower tracks which form the loop offer outstanding views of Mt Ngauruhoe’s symmetrical volcanic cone, the older more eroded summit of Mt Tongariro and massive Mt Ruapehu. The terrain ranges from tussock and alpine shrubland, mountain beech forest and the small river gorge of the Wairere Stream. Keep ears and eyes open for small native birds who inhabit the area. So when you’re planning your New Zealand vacation with some hiking in mind, create or choose a New Zealand itinerary that offers time in this spectacular region. 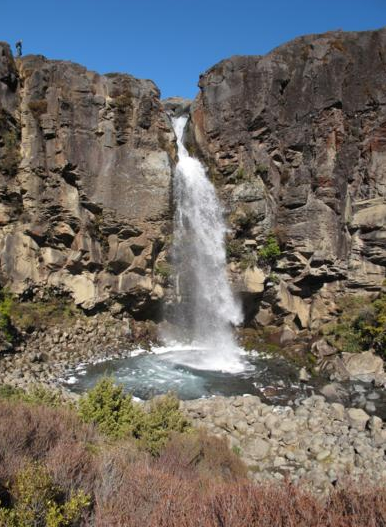 WithKiwiCombo Pass most self drive itineraries can be modified to ensure you have hiking time. New Zealand offers an outstanding opportunity to create educational, cultural and fun family holidays for you and your children. For family holidays, fun comes first! New Zealand offers an abundance of opportunities for you and your children to engage in educational and cultural activities as well as enjoy the natural outdoors. The country is like one giant natural theme park. Often it is the simple things that create the most fun, such as building sandcastles on the beach, tucking in to a delicious picnic lunch on a remote river bank or taking a gentle hike through native forest in the evening to see glowworms. Connecting with wildlife is quite enchanting, whether it be in a reserve such as Willowbank, Wild Kiwi, Kiwi Birdlife Park or Rainbow Springs where you can see local birdlife up close, or in the wild when a kea, our native parrot, perches on the rear vision mirror of your car – which can also be very close! In Oamaru and Dunedin there are opportunities to see penguins coming in to shore early evening after a day fishing. Dolphin watch cruises in Akaroa, Kaikoura and the Bay of Islands are a wonderful way to see how these amazing creatures love to play in the waves. 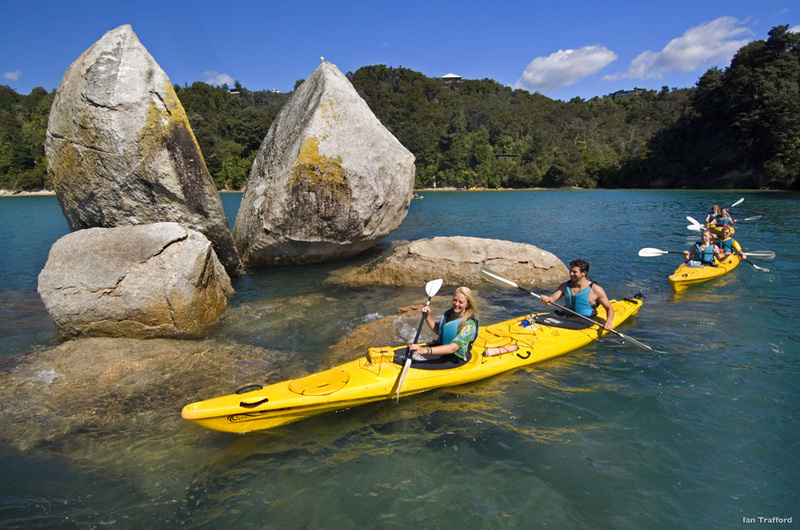 Safe swimming, golden sand beaches such as Kaiteriteri near the Abel Tasman National Park offer an inexpensive way to spend the day outdoors with the kids. Take a picnic – treat yourselves to delicious New Zealand ice cream. Lake shores and rivers are also wonderful swimming pools, but take care to swim with others and check the depth of the water first. Of course, farms are everywhere and there are plenty of opportunities to see sheep, cows, deer etc as you drive through the rural regions. Spring, Aug/Sept, is the best time to see the cute lambs frolicking in the paddocks. For a more up close encounter, visit Walter Peak High Country Farm near Queenstown or the Agrodome in Rotorua where there are oppourtunities to get up really close and touch the animals. New Zealand’s unique Maori culture offers entertainment as well as an educational experience. Rotorua in particular is renowned for its rich cultural heritage, displayed when visiting a Maori marae (village) for a hangi (traditional dinner) and evening of chants and songs, including the renowned Haka, made famous by the All Blacks. If you are only travelling to the South Island, check out Willowbank for a guided kiwi tour followed by Ko Tane Maori cultural performance and Kiwi Haka at the Skyline in Queenstown. Sports are an integral part of our New Zealand culture and you will easily find sports grounds, adventure playgrounds etc as you travel around. Saturday mornings are for family sports, so why not head to the local sports ground and watch some rugby, soccer or netball or hockey from the sideline? Take some Cadbury chocolate to keep up your energy levels. When you are travelling with children, family-friendly accommodation is important. New Zealand’s family-style motels are a great way for everyone to enjoy living space and kitchen facilities so you can cook your own meals if you like. Self catering is convenient and helps the budget too! Many motels have BBQ facilities, swimming pool and playground for children. Plan your trip well so that you have “stay put” time at key destinations so you can relax and enjoy some fun together. Consider sample itineraries as a helpful start to your family holiday and ask for advice so you make the right choices. New Zealand is perfect for exploring and learning. Simple and fun. New Zealand is a renowned honeymoon destination for the rich and famous, but simple pleasures can make them affordable & achievable. So live the dream! New Zealand is a renowned honeymoon destination for the rich and famous. But with some smart planning, realistic objectives and focus on enjoying the great, natural outdoors, New Zealand is a very achievable honeymoon or anniversary vacation for those on a more modest budget. Sometimes it’s the simple pleasures that make the best memories! We would all like to be pampered at a luxury lodge or 5 star resort hotel, but when reality kicks in and choices have to be made there is a good range of affordable accommodation alternatives available. New Zealand’s motel accommodation is generally excellent value and offers you a “home away from home” with your own living area, kitchen, ensuite and bathroom. Instead of dining out every night, perhaps self cater some evenings. It’s fun to explore local markets for fresh fish and meat, vegetables and fruit and create your own style of dining, with a kiwi twist. Try our succulent lamb, farmed salmon and salad ingredients straight from the market gardens. Many motels have free barbecue facilities in picturesque garden settings which provide the ideal setting for a relaxing, balmy summer evening. Purchasing a cooler bag to keep in your rental car is a great way to take food items with you. Having snacks and lunch on hand when you discover a deserted beach or quiet riverbank is very convenient and offers you the opportunity to spend more time at these special places rather than hunting out cafes and food stores to replenish the energy levels. Unlike some countries, New Zealand’s breathtakingly beautiful National Parks are easy to visit. They offer some of the most outstanding scenic landscapes, accessible by well maintained hiking trails that often lead to cascading waterfalls, remote lakes and majestic forests and native bush. Take a picnic lunch in your day pack and spend entire days enjoying and sharing these spectacular natural attractions. Find your own stretch of golden sand beach. You won’t need your credit card. Just leave your footprints in the sand until the next tide. With a little planning and creative thinking it’s very possible to keep the budget under control. Admire the landscapes, savour the fresh air and space – they don’t cost anything, but they are very valuable, simple pleasures. Check out some helpful sampleNew Zealand itineraries to use as a starting point, make smart decisions about your travel expenses, prioritise where you want to spend your budget. For example, after a few nights in good quality 3 star accommodation, you might like to treat yourself to some 4 or 5 star luxury for the next couple of nights. This adds variety, helps the affordability and makes your honeymoon very special indeed. So, if New Zealand is on your horizon as a honeymoon or romantic holiday destination, start planning now! Located in the carpark of the spectacular Dunedin Railway Station, the Dunedin Farmers Market is a “must do” for food lovers visiting Dunedin. Go early! That is the best advice for any visitor heading to the Dunedin Farmers Market. Officially called the Otago Farmers Market because the heavenly fresh produce comes from all around the district, this event is held every Saturday morning from early until about noon. Skip breakfast and head to the spectacular Dunedin Railway Station where the market is held in the adjacent carpark. At 9.30am there is still room to move, wander from stall to stall, sampling this and that, chat with the growers. By 10.30 it’s elbow to elbow – but still fun! From whitebait patties to fried dumplings, fresh coffee to pinot noir wines, hand-made breads, muffins and cupcakes to fresh vegetables, exquisite cheeses, meats direct from the local farms and fish straight from the ocean. It’s all here but you’ll need an exploratory circuit to absorb all the offerings first. Then go around again and choose your favourites. The colour and music all add to the sensory experience. If you’re staying in motel or apartment accommodation with cooking facilities a visit to the market offers the opportunity to stock up for a couple of days with fresh and unique food that is distinctively “New Zealand”. If you love food and wine, then take the time to chat with the growers and producers and get some handy preparation tips. Take a knapsack with a frozen cooler pack to keep the goodies nice and fresh. Ideally allow at least an hour, but longer is better. Your taste buds will thank you for it. Winter in New Zealand is mild (compared to North America and Europe) and still has plenty to offer road tripping travellers. If you want to avoid the summer crowds, but still experience New Zealand at its most breath-taking, winter road trips are a good option. Parts of the North Island are sub-tropical – meaning the winter months are still mild and great for travel. The average winter temperature in the Bay of Islands is a balmy 16 degrees Celsius and can reach the mid-20’s occasionally. 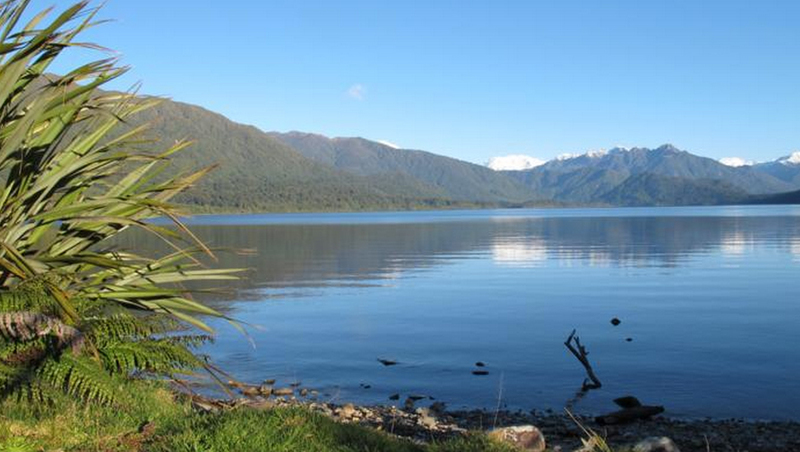 In the South Island you’ll find cool sub-zero temperatures overnight and crisp sunny days. When travelling from Christchurch to Queenstown there is no shortage of snow-capped scenery to take in. Winter is a superb time to travel in New Zealand if alpine sports are your passion. In the North Island you will find Mt Ruapehu (and its two ski areas – Whakapapa and Turoa), and in the South Island there are dozens of ski areas stretching from Rainbow Ski Area in the Nelson region, to The Remarkables and Coronet Peak in Queenstown. KiwiCombo Pass is a great option when considering a New Zealand road trip. The flexible pass options include Thrifty Car rental car hire and your choice of motel or hotel accommodation. Activities can also be added for extra convenience. Visit the KiwiCombo Pass website for more information. Queenstown’s Skyline Gondola is a “must do”. And doing it early in your Queenstown visit will give you an excellent overview of the region’s geography. The Queenstown Skyline Gondola is an excellent way to get a bird’s eye view of Queenstown resort, Lake Wakatipu and surrounding mountains. By doing it early during your stay, you’ll get a good overview of the region’s geographic features which will help you find your way around. It only takes a few minutes by gondola to ride the 450 vertical metres from the base station to the Skyline complex on Bob’s Peak. If you can, ride up and down with your back to the hill so you get the primo views across the lake to the Remarkables Mountains, Cecil Peak and Walter Peak. The Skyline complex is open 365 days, 0900 until late. 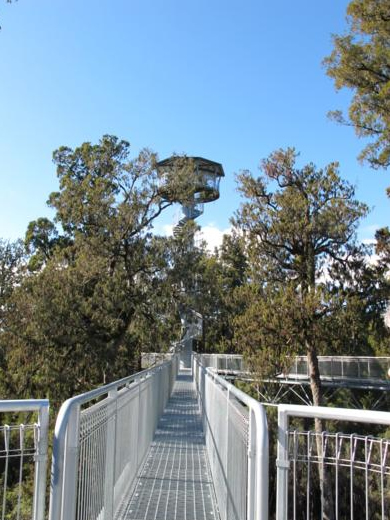 As well as offering stunning vistas from the viewing platforms, the complex also features a daytime cafe, Skyline Restaurant with buffet lunch and dinner,the Kiwi Haka live performance of authentic Maori songs and dances, downhill luge rides, star gazing and mountain bike trails. If time is precious, then allowing just 30-45 minutes at the start or end of your day will still be very rewarding. The lower sun early morning or at dusk also makes for spectacular photos. But if you have more time to linger and enjoy some of the additional activities, you’ll be assured of a great time. New Zealand’s hot thermal & mineral pools add a very relaxing dimension to a New Zealand holiday. Have family fun or relax with your travelling companion. New Zealand is sprinkled with an amazing array of hot thermal and mineral pools, thanks to its regional geothermal activity and some very clever man-made creations. As well you can call in to Taupo and visit the De Brett Hot Springs, AC Baths (great for kids) and Wairakei Terraces Hot Pools (adults only). Walk along the foreshore of Lake Taupo and in some places you’ll feel hot water seep up between your toes through the pebbles. In the South Island, the Franz Josef Glacier Hot Pools are nestled into lush rainforest. With private and public pools, massage and day spa, it’s the perfect day’s end after a hike on the glacier. KiwiCombo Pass is a great option when considering a New Zealand road trip. The flexible pass options include Thrifty car rental and your choice of motel or hotel accommodation. Activities, including hot pool and spa bookings, can be added for extra convenience. Visit KiwiCombo Pass website for more information and assistance. Staying safe in your New Zealand rental car during the winter is easy, if you know what to expect. Winter in New Zealand runs from June to August, but you’ll often find late snow flurries around the country’s alpine areas well into September. If you do find yourself driving in snowy conditions make sure you carry snow chains in your vehicle. Most New Zealand rental car companies provide chains. In some areas of New Zealand, such as the Queenstown Lakes District, there are heavy fines imposed for travellers who are unable to fit chains when asked by traffic enforcement officers. Whilst heavy, prolonged North America or Europe-style snowfall is rare in New Zealand, you will often encounter sub-zero temperatures and icy roads. Black ice (patches of ice on the road that are not visible to the eye) are common during winter, so always take your time on cold mornings and slow down around sharp bends. Before setting out on your journey check the weather forecast and any road road closure warnings. If you do find your intended route is closed, visit the local i-SITE Visitor Centre to find an alternative. New Zealand is a very scenic country. Don’t rush from point A to point B – take your time! Unlike the super highways of Europe and North America, New Zealand roads are often very scenic and winding. A journey that might look short on the map can take longer than you think. Stop often, rest and revive and take in the beautiful views! KiwiCombo Pass travel passes are a great way to enjoy New Zealand during the winter. Choose your Thrifty rental car and hotel or motel accommodation and enjoy New Zealand at your own pace.